If you're looking for a set of budget active noise-canceling headphones that are actually up to the task, AKG's N60 NC Wireless will get you where you need to go. It’s been a while since I’ve voluntarily used a set of noise-cancelling headphones in my private life, but I’ve quite enjoyed AKG’s N60 NC Wireless headset. Sure, it goes against everything I stand for in headphone tech, but I’ve had to fly cross-continent a few times this week… and my personal cans just weren’t going to cut it. 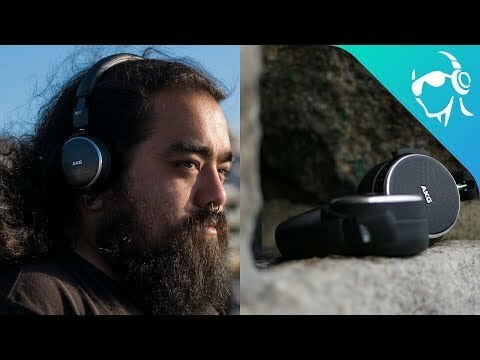 Not only does the N60 NC Wireless offer a respectable level of noise cancellation, but it does so while not making too many sacrifices along the way. Review updated October 21, 2018 to reflect updated information on Bluetooth. Inside the box, you’ll find a standard 3.5mm male-to-male cable, a microUSB cable, a neoprene carrying case, and your headphones. Like most ~$300 ANC headphones, the AKG N60 NC Wireless looks fairly nondescript. It’s made of mostly plastic, and very few elements are going to make you stick out in a crowd. While there’s definitely a segment of headphones buyers that want to make a statement, not everyone does; and these would be at home in business class. I suppose it only makes sense that Lufthansa chose the N60 NC Wireless to use on their flights, but good on them for providing a model that works as well as this. Volume buttons are convenient, but push wild swings in loudness when you use them. As you can imagine, I say this because looks aren’t everything: the real draw to the N60 NC Wireless is what it can do. Bluetooth headphones are a dime a dozen nowadays, but Bluetooth headphones that sound decent are a little more scarce. It’s even more rare that a set of decent Bluetooth headphones is also good at cancelling noise. Which is why I enjoyed using the N60 NC Wireless in my travels this week: they are perfect airline buddies. They do everything they set out to do well, and without the hassle of cables or short battery life. While I’m not sure that the 30 hour battery life listed in the specs is accurate, I can tell you that these headphones will easily last you a cross-continental flight because I did exactly that this week. Twice. Controls live on the right ear cup—from the power switch, to the volume, to the track controls. I’d hazard a guess that you’re probably not going to be listening to them for the whole flight though, as that band can dig into your skull a bit if you have short hair like mine. Even though the ear pads are super deep and wrapped in a soft leatherette, over time these headphones become quite uncomfortable if you don’t have the band adjusted to be a bit loose on your head. Controls are simple and the unit is fairly easy to pair when using the power slider. On the right ear cup is the volume, track, and power controls, while the left ear cup has the USB power port, and the 3.5mm female socket for the detachable cable. I appreciate any set of Bluetooth headphones that give you the option of using a detachable cable, but I’m a little mystified at the choice to use a microUSB port for charging. Not only is it slower to juice up, but more and more people are using USB-C chargers nowadays; why not use a more modern connection? It’s not a horrible thing, just a strange one. On the upside, you could use a phone charger you’d otherwise throw out to live with your new cans. Decent Bluetooth performance with a good battery life means the freedom to listen all day without futzing with cables. When you want to go wireless, the AKG NC60 NC Wireless relies on a Bluetooth radio capable of using AAC or aptX codecs. Even if you’re limited to using an SBC profile with an older phone, the N60 NC Wireless is capable of supporting a decently ample bitrate in my experience with a few of the phones we have laying around at the office. However, I did notice that the cans have trouble preventing skipping if you’ve been listening to them for a long period of time. After having used them for about 9 hours straight, they started to stutter on the walk from the BART station to the office—and my phone was only in my pocket. 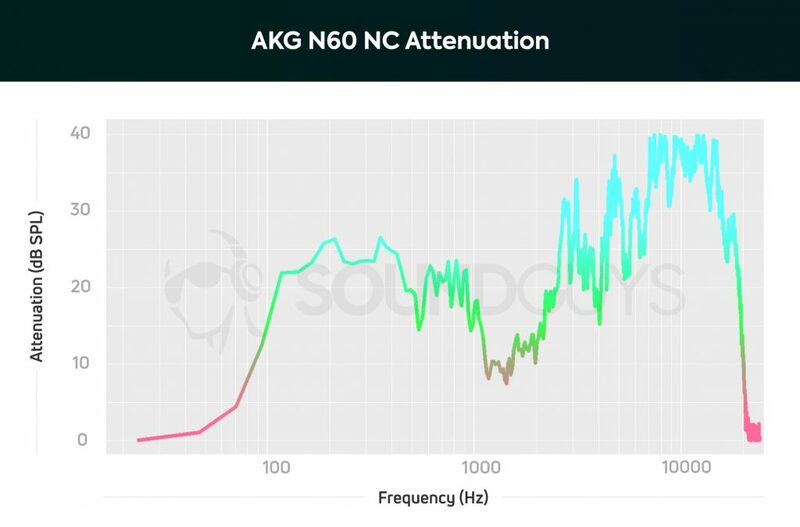 How does the AKG N60 NC Wireless sound? I’m a big fan of these headphones. Not because they’re going to make audiophiles squeal with joy or that they’ll win over the toughest critics, but because they allow you to listen to your music at a super low volume. I recently made a post about this, but the long and short of it is: outside noise makes your music sound bad, and most people crank their tunes to drown out noise. If you can listen to your music without cranking it up to 11, it’ll sound better (while prevent hearing damage long-term.) So if you have a stellar set of cans that block out a ton of noise, they’ll sound a ton better in more environments than even high-end headphones will; even if they don’t sound amazing. That’s pretty much where the N60 NC Wireless stand. They sound perfectly fine enough with a consumer-friendly sound, but they definitely won’t make me forget the HiFiMan Edition S or anything. Because their isolation is so good, there’s no reason to grab anything else for a flight or commute. I wish you could turn off the ANC to save battery, but c’est la vie. If you’re a younger user, you may notice a bit of distortion in the lows and mids due to the ANC unit, but it’s not terrible. Just something to be aware of. The bass is a bit boomy, but otherwise not over-emphasized to a silly degree. There’s a little bit of echo due to the closed-back nature of the headphones, but if you’re a fan of bass these are a great option simply because the isolation is so good in that range. You won’t be missing the low synths in Panama Wedding’s Easy Lover. Mids and vocals are treated fairly well, with minimal distortion due to the ANC unit. As the note emphasis tends to follow a normal consumer-friendly emphasis with a little bump in the high mids, and a little bit of a dip in the low mids. Not much to gripe about, it sounds quite alright. If you’re a young’n, you may notice a bit of a rolloff in the highest of the high notes. But the advantage here is that there isn’t a harsh peak to make your listening experience a tough one to endure. Many people don’t like the normal jump in emphasis of high harmonics, so if you find headphones tend to have a shrill quality these are cans that might solve that problem for you. But the mic… I got so many complaints from my usual Overwatch buddies about the sound quality, and that’s saying a lot for a simple client like Discord. You’ve probably not going to be making a lot of phone calls while you’re in the air, but keep in mind that mic could use an improvement. At first I thought it was due to my old wireless/Bluetooth card, but even after I replaced it with a brand new card—the quality was still bad. I still don’t like Bluetooth headphones. But a lot of people will like the AKG N60 NC Wireless. Even a stodgy jerk like me can appreciate the convenience they provide, and performance-wise they’re not half bad. They isolate very well for a set of on-ears (a design that typically struggles), which helps the N60 NC Wireless shine in noisy environments like a subway, flight, or noisy street. They’re not the greatest performers, so audiophiles may want to spring for a pair of in-ear monitors for air travel instead—but the advantages of an aptX-supporting on-ear model are clear. They’re more comfortable than earphones, and easier to use for long periods of time. The N60 NC Wireless isn’t made to go toe to toe with high-end cans: they’re made to be used where other headphones fail. Those who can’t stand in-ears for long won’t find a better bang for the buck for air travel. Even at $250, their price point puts them in a good place to compete with the Bose and Sony NC headsets; but the QC35s offer a bit more isolation in the low end. If money’s tight, you may want to save yourself the $100 extra you’d drop on the Bose set and just grab the AKGs. KG N60NC wireless headphones feature AKG Signature sound that’s deep in bass and rich in the mid-range, as well as best-in-class noise cancellation that’s fine-tuned for traveling. And while a single charge gives you 15 hours of uninterrupted listening pleasure with both Bluetooth and Active Noise Cancellation turned on, they sound just as awesome in the passive mode. A button on the ear-cup lets you control all music playback, and Bluetooth gives you wireless access to all your music. Best of all, the flat-foldable design and thoughtfully-included accessories – airline adapter, tangle-free fabric cable, carrying case – mean these headphones are ready to travel when you are.